Can I use a thick or double layer underlayment with laminate? 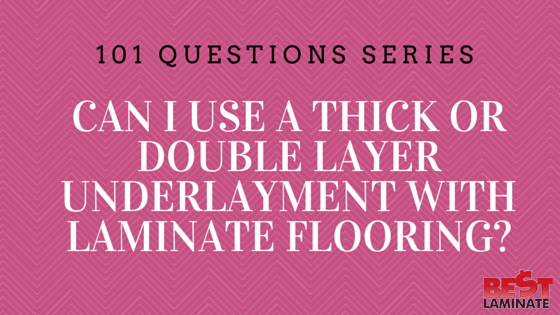 Home >> 101 Questions Series >> Can I use a thick or double layer underlayment with laminate flooring? No, it is not recommended to install a thick or double layer of underlayment with laminate flooring. Underlayment is manufactured and meant to be used as only a single layer to allow your floor to be balanced and float properly. 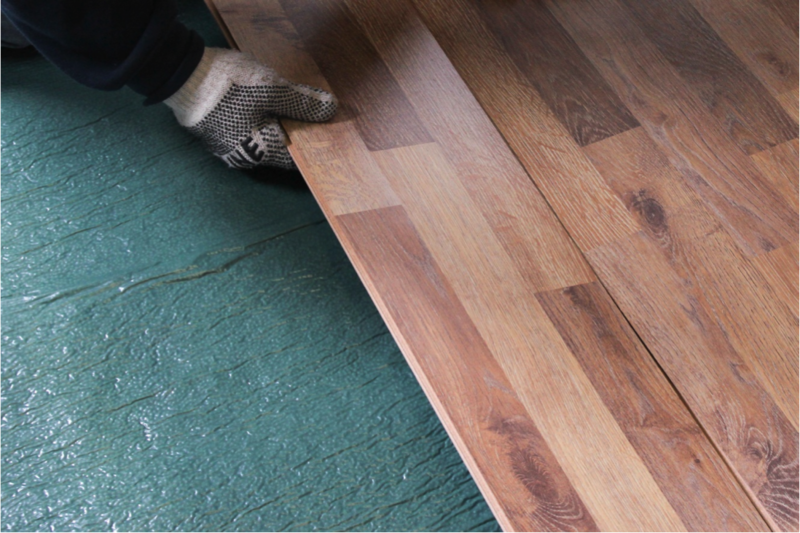 If you install any additional underlayment, the base for your flooring will end up being too soft and could jeopardize the integrity of the locking system. What you can do is install a premium underlayment that gives you exactly what you need. The reason why we get asked this questions is because people are worried about having proper sound reduction or enough cushion for accidental falls. 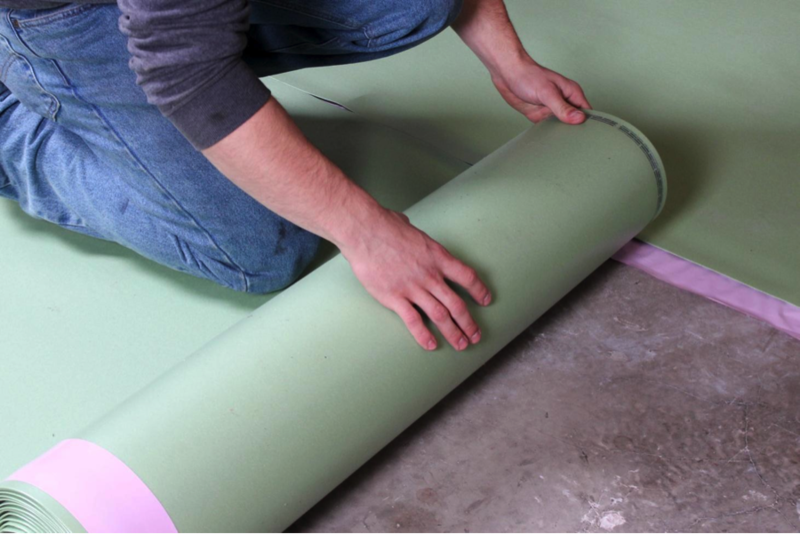 This 3mm three-in-one underlayment is one of the most premium underlayment options. With sound reducing properties, a thick core to improve minor subfloor imperfections and airflow technology, this underlayment will not disappoint. The airflow technology within the underlayment gives your floor the proper exposure to air and to keep it mold and mildew free. Floor Muffler is known to be one of the best sound reducing underlayment options on the market. It has been selected by award winning researchers as “The World’s Greatest” underlayment and is popular among Bestlaminate customers. In addition, the polyprophylene advanced cell technology protects the structural stability of your floor. This underlayment is also moisture proof, so you can install it over cement subfloors and not have to worry about mold or mildew! Let your floor breathe! This multifunctional underlayment from Kronoswiss provides heavy duty sound insulation underlayment. Optimized through extensive test series and laboratory tests to provide high-level, lasting impact sound insulation. Kronoswiss ProVent not only effectively minimizes the noise level when walked on, but also the sound level transmitted through the floor into adjacent rooms. Rated STC67 and IIC 71 provides great noise insulation; perfect choice especially in condos and other multi-floor constructions. Unique Micro-pumping System supports air circulation. ProVent underlay is shaped to allow the formation of a system of air channels which ensures a constant exchange of air when walked on and also eliminates water vapor from the floor. There are plenty of premium, high performance underlayments available at Bestlaminate. If you have any questions as to which underlayment will suit your needs, you can write in the comments below or give us a call at 1-800-520-0961! I own a 2nd floor condo in Florida and the Condo by -laws won’t allow anything but carpet on the upper floors due to noise transmission. We use this as a rental unit part of the year to defray costs. I am trying to convince the board members to allow condo owners to have multiple options for flooring options other then carpets on the upper floors. I would like to know what is the best sound pad underlayment available to use with either luxury vinyl plank or floor laminate to achieve superior sound proofing equal or better then carpet. My goal is to provide recommendations to the condo owners with more floor options and a longer lasting product then carpet. Our condos have 6″ concrete flooring with no acoustical ceilings in the apartment below. Hi Thomas, thanks for reaching out. We would recommend Floor Muffler underlayment, which has the highest and most effective sound barrier for floating floors. An IIC rating 65+ is a high level of impact sound transmission absorption and includes superior sound reduction materials like carpet and cork. Hi Pat, thanks for your question. With a crawl space and humidity as a factor, you will want to look at an underlayment with a vapor barrier. All underlayments will address minor subfloor imperfections, but it is important to have a repaired and proper subfloor before installing a floating floor, as this can cause damage down the road. If you’re looking for just a vapor barrier, and not sound reduction of the floor, I would go with the 2-in-1 Yellow Vapor Underlayment: http://www.bestlaminate.com/vapor-barrier-2-in-1-underlayment/. If you’re looking for an underlayment that also has sound reduction for a quieter step, I would recommend the 3-in-1 Blue, 3-in-1 Silver or Kronoswiss Provent. Here are the links: http://www.bestlaminate.com/vapor-3-in-1-blue-underlayment-100-sq.ft-roll/; http://www.bestlaminate.com/vapor-3-in-1-underlayment-silver-100-sq.ft-roll/; http://www.bestlaminate.com/provent-silent-vapor-3-in-1-underlayment-215-sf/roll/. Let us know if we can answer any additional questions.